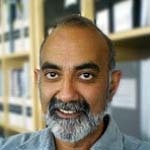 A Professor of Architecture at Carnegie Mellon University since 1989, Ramesh Krishnamurti has taught courses in configurational design, symmetry, geometry, computer modeling, computer programming, and user interface design. His principal area of research is in computational design with particular emphasis on the formal, semantic and algorithmic aspects of generative construction and the development of design as computation via highly-coupled parallel explorations of form and description. He is perhaps, best known, for his work on the computational problems in shape grammar theory and for algorithms for spatial patterns. Kristhnamurti has worked on object-agents in design environments, knowledge-based design systems, the integration of natural language and graphics, spatial algorithms, robotic construction, computer simulation, computer graphics and graphical programming environments, user-interfaces for a variety of design applications and computer supported collaborative work. He is currently working with researchers from Civil Engineering and Robotics, looking at the utilization of laser scanning and embedded sensor technologies within a dynamically changing construction environment, and in “interpreting” the 3D as-built environment model generated through scanners and embedded sensor systems, and “assessing” the implications of what is interpreted; and with researchers from Delft University, looking at generative design and model representations, and motivated by the fact that different groups of people and applications have different views of the same informational structure.